On June 28th we started to publish regular updates with news about the NoG20 protests in Hamburg. Today with block the summit and other updates. We will update this page regularly. Refresh the page to see the updates. You will find all our No G20 stories here. Update 06:00pm NoG20 Hamburg. Livestream from Hamburg; here. Update 05:35pm NoG20 Hamburg: People building small barricades. Cops watching on a distance. Update 05:30pm NoG20 Hamburg: Several small barricades between Fischmarkt and Landungsbrücken. Update 05:16pm NoG20 Hamburg: Cops cleared Landungsbrücken some minutes ago. RT BILD_Hamburg "RT CarlPWalter: Polizei räumt Landungsbrücken unter Flaschenbewurf #nog20 #BlockG20 pic.twitter.com/kgB9hMu81t"
Update 05:15pm NoG20 Hamburg: Cops on horses now also at Landungsbrücken. Update: 04:45pm NoG20 Hamburg: German daily Neues Deutschland reports 11 people badly injured in Hamburg-Bahrenfeld. They climbed at one of the fences after they were attacked by riot cops. The 4 meters high fence collapsed. 14 people were taken to hospital. 11 badly injured and 3 more people slightly injured. Yesterday more than 100 people were injured after the police attack against the peaceful Welcome to Hell demo. 5pm today at centro sociale G20 and activist repression stories and reflections. Update 03:58pm NoG20 Hamburg: Riot cops kettled about 50 people at Landungsbrücken. They also used a water canon to get these people. Update 03:32pm NoG20 Hamburg: Tweet below says he is bad in estimating but there are far more than 5.000 people ready to start “Colour the Red Zone” action. Update03:28pm NoG20 Hamburg: Riot cop squads are at the St. Pauli Bhf (train station) . “Colour the Red Zone” action is about to start. The U3 (underground line) does not stop at St. Paul Bhf. Update 03:07pm NoG20 Hamburg: Everything peaceful at Reeperbahn at the moment. More and more people are coming here to start another demo. Solidarity greetings to Hamburg. While the government representatives of the G20 summit are protected by at least 20000 cops (because the ruling ones are so afraid of those they supposedly represent), we blocked the Hambachbahn by means of a tripod. Today, we have opted for the path of non-violent resistance – this does not mean that we want to reflect on attempts to divide peaceful protest from militant resistance or that we basically condemn militant counter-raids from below. Update 02:18pm NoG20 Hamburg: Cops say the German army will not be deployed in Hamburg. According to the cops this convoy is “only” transporting material for the cops. The cops didn’t say what kind of material. Update 02:25pm NoG20 Hamburg: More and more tweets claim that the German army is on its way to Hamburg. These Tweets (below) show pictures from Ostdorf. We have no confirmation yet that the army will be deployed to supress NoG20 protests. On the evening of July 6th the police has violently attacked the »Welcome to Hell« demonstration at it’s starting point at Fischmarkt in order to prevent any demonstration from happening. Both the protest rave the night before and the initial event this afternoon took place without any incident. Update 01:35pm NoG20 Hamburg: Depsite calls for help to send more riot cops to Hamburg to support the 19.000 cops that are already there, the German state of Thuringia announced that they can’t send more riot cops to Hamburg. Hamburg, right now, is looking like a war zone. Update 12:43pm NoG20 Hamburg: Melania Trump had to stay in her guesthouse because of the blockades and other actions across the city; security concerns. Melania was not able to join the partner programm. Wegen #BlockG20 hat es @FLOTUS nicht zum Partnerprogramm #G20 geschafft – offenbar keine Sicherheitsfreigabe zum Verlassen des Gästehauses. Update 12:19pm NoG20 Hamburg: Students are on strike today in Hamburg. Right now a “youth against G20” demo with 4.000 people is marching. One of many activities that are going on right now. Update 11:59am NoG20 Hamburg: Confirmed information that additional cops from all German states are ordered to come to Hamburg to support the 19.000 cops that are already in Hamburg. Update 11:55am NoG20 Hamburg: Situation at Kleine Schäfercamp. Update 11:50am NoG20 Hamburg: According to the tweet below the hotel where Putin is staying was attacked. Update 11:50am NoG20 Tomorrow, July 8; demonstration against police violence and G20 in Wuppertal, Germany. Starting point: Alter Markt (03:00pm, 15:00). #NoG20 Tomorrow, July 8; demonstration against police violence and G20 in #Wuppertal, Germany. Starting point: Alter Markt (03:00pm, 15:00). N24 news TV reports that extra cops from across Germany are ordered to reinforce the 19.000 cops in #Hamburg. #BlockG20 #NoG20en #NoG20. Update 11:16am NoG20 Hamburg: Cops lost control of parts of the city. They ordered reinforcements from Berlin (video below). 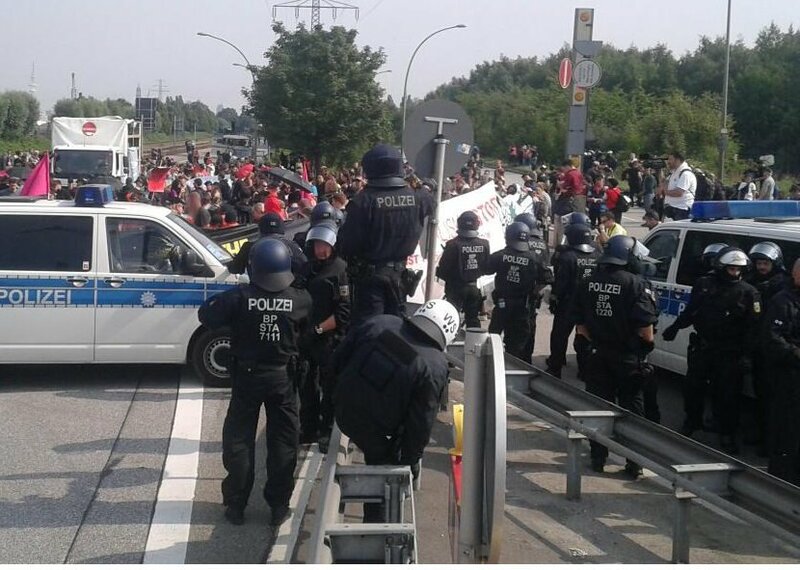 Update 10:54am NoG20 Hamburg: At the Gorch-Fock -Wall a convoy of G20 delegations are stuck because of one of the blockades. Update 10:47am NoG20 Hamburg: Video from 09:22am this morning. Clashes and chaos across Hamburg right now. 10:30am NoG20 Hamburg: Good morning w are a bit late after the long night… but were back and will start our live blog now. Today the summit will be blocked by activists. You can find the plan of action for today here.